Go with the flow* | carpe diem! To celebrate the end of the Hateful Socks (news just in: one foot is too tight because he’s got one foot bigger than the other, and he’s decided he doesn’t like heelflap heels, so I may end up with them in my drawer), I joyfully dug out my skeins of Kirsty’s ‘Seat by the Fire‘. Visit her blog to see pictures of a puppy so sweet that she should carry a Government Health Warning. Thoughts of Monkey Socks in this yarn sustained me through the Hateful Socks; I’d tentatively named them ‘Treacle Pudding’** because the yarn colours remind me of golden syrup as I pour it into the pudding basin. 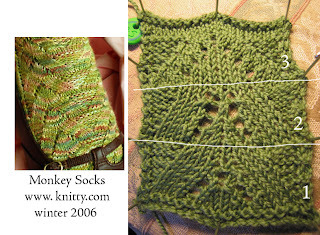 The Monkey Socks pattern is written top-down. I cast on for toes as usual, planning simply to knit the chart backwards so the little reverse-stockinette aka purl triangles would point nicely down my legs, too. Halfway into the first pattern repeat I stopped to admire the pattern… and realised I couldn’t. It wasn’t right. I ripped the socks back to the start of the pattern (no fun with two socks on two circulars) and had sufficient intelligence (thank you, fairy godmother) to stop and think about WHY it hadn’t been right before I started again. Too late to work it out from the now-vanished socks (but more intelligence would make life easier, thanks). The short story: the photo at top represents 2 hours last night, and another hour (from 0630 to 0730) this morning. I should have spent less time with pencil and paper, more time with yarn and needles working on this, er, design note, because knitting showed me, quite quickly, what had gone wrong. Knitting is directional: it flows off the needles and away, downhill, swirling around obstacles in a flurry of yarnovers… sorry, getting carried away there. But it is directional and clearly, for some patterns, the direction matters. 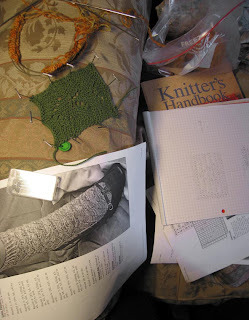 Alright, I thought, I know how to make stockinette rivers flow: I’ve done it in lace. So I moved the decreases to the inner edges of the arrowhead, next to the yarnovers, to pull the river of stockinette in that direction. Then an increase into the crisp edge of the river made the purl stitches appear as if by magic. Perfect. Gah. That’s two increases (YO and M1) and only one decrease, I need another decrease or I’ll have too many stitches. In ‘1’ I placed another decrease just inside the yarnovers and created a crisp edge, no good, too obtrusive, and anyway when I got to the final decrease where I should have had a double YO as the culmination of the YOs on each side, I had instead two live knit stitches needing a home. I tried a central YO with the knit stitches on each side feeding into the next set of stockinette. No. Messy. Try again. Wait a minute. Why am I doing this? Trying to force a decent, honest pattern to work backwards when it clearly doesn’t want to? Why not go with the flow and knit it top-down, the way it wants to go? I’ll draw for birthday prizes on Friday, after I take him to the airport. Also, while I think of it: the green thing hanging off the swat, er, design note is a record of the needle size used. I rolled out a cylinder of FIMO modelling clay, cut it into discs, punched a hole in each, incised a variety of needle sizes into the discs, then fired them in the oven. People who make stitch markers from this stuff could undoubtedly make much better ones, much more quickly. Think Brighton Rock. This, not any other Brighton Rock. Google found lots. * A friend gave me a button that read ‘Only dead fish go with the flow’, but I’m ignoring that for the purposes of this post. ** Basically this recipe, skipping the lemon zest in favour of more golden syrup in the basin. With lashings of golden syrup and cream poured over individual servings. Friday is Dessert Day! This entry was posted in Uncategorized on March 13, 2007 by sarahw. Ahh, I wrote you a note and it’s disappeared. I’ll try again. The puppy is terminally cute. Almost makes me want another one. (not. )I hear you regarding the socks. Sometimes it makes sense to just follow the pattern and turn off the brain. The yarn looks scruptious. I am having an important “get ready for vacation” work day. Loading ipod, planning knitting projects, and doing laundry. I am wondering if I’ll fit into my warm weather clothes though…I’ve been eating way too much dessert, leftover from Fridays! there are so many patterns that need mods- so when a pattern is well written and “works” I just let it. its liberating and fun! Just left a comment but it doesn’t appear to be here, I’ll try again if I can remember what I said, sorry!You put in a lot more effort than I would have done, I probably would have given up after the first attempt! I tend to be a bit of a lazy knitter though, I’ll change things if they really need it, other that that I just tend to knit them. It would have driven me crazy, too. But I wouldn’t have been able to even TRY to get it right. I would have given in the minute I realised, whilst feeling as though an itch was left unscratched.Short comment in between throwing up (sorry). I should reassure you it has nothing to do with your post!